Lumberton, North Carolina, resident Kevin Caudle, his wife and son put on calf-high rubber boots and grabbed handfuls of garbage bags to retrieve belongings from their home in a flooded neighborhood. They had stayed in their house until Sunday night, when rising floodwaters prompted them to go to a relative’s home on drier ground elsewhere in Lumberton, which is about 90 miles (145 kilometers) northwest of Wilmington . Caudle said Hurricane Matthew had damaged some duct work but had not totally ruined his house nearly two years ago. Surveying the murky brown water that had risen by Monday morning, he said Florence’s deluge appeared worse. Caudle and his family then waded into the brown water, past a U.S. Coast Guard trailer where three boats had launched to patrol the neighborhood and rescue people needing help. On one of those boats was Julie Lamb and her 15-month-old twins. 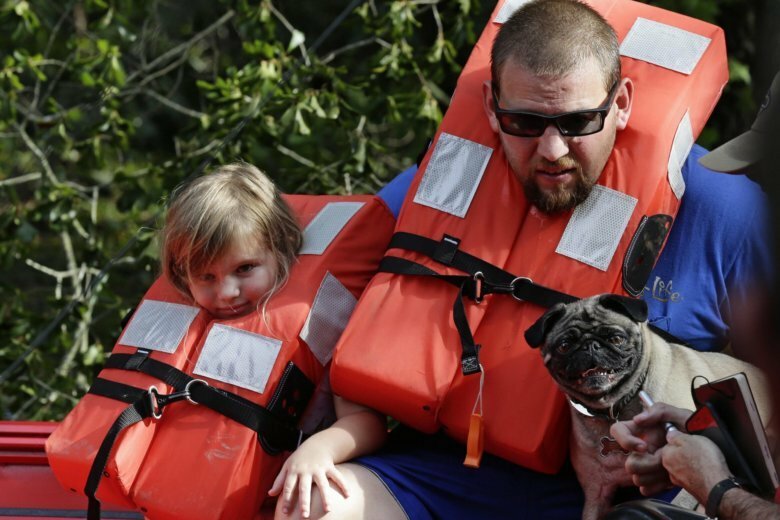 Lamb’s husband, 4-year-old daughter and pug dog were waiting for a second boat to rescue them from the home of Lamb’s parents. During Matthew, flooding never reached the house. But Monday, the yard was underwater, and the flooding looked far from over. “It’s coming up. We were just praying for the best,” Lamb’s husband, Brian, said. Miguel Melo was trying to drive from North Carolina to Florida to get to a friend’s house when his SUV stalled out in high water in Lumberton. The 22-year-old got stranded with his stalled car in a dry patch on a service road parallel to Interstate 95, which was closed due to rising waters. “The GPS brought me here. It’s stupid, and it’s really bad. I’m in trouble,” said the Raleigh resident. State officials had warned in previous days that GPS was aiming people toward flooded routes and urged people to check for road closures before driving. Melo called his car insurance company to send roadside assistance, but he was not sure when or if it would arrive. He shrugged when asked if he had been concerned about driving through an area hit by the storm. “I’m crazy. I made a bad decision,” he said. Liz and Lee Reeser evacuated from Eastover, north of Fayetteville, North Carolina, to a friend’s farm a few miles away when a swamp drainage canal feeding into the Cape Fear River threatened to flood their home Sunday. By Monday morning, their cul-de-sac was covered in at least 2 feet (0.6 meters) of water, nearly submerging mailboxes. Even though rain has started to let up in the Fayetteville area, floodwaters continue to rise as the region drains. The Reesers didn’t want to take chances with Florence, especially since the fire department had to rescue them when Hurricane Matthew flooded their home two years ago. Lee Reeser said they were not able to return to their home for 13 months after that storm. Associated Press writers Jonathan Drew in Lumberton, North Carolina, and Alex Derosier in Eastover, North Carolina, contributed to this report.